In 15 years of teaching, I’ve never seen anything quite like this. I teach classes part time at the University of Nevada Las Vegas at night. A couple of weeks ago, the English Department asked me to take over the class of another teacher who wouldn’t be able to finish the semester due to health problems. I was given a folder with class records and copies of their most recent essay project, which still needed to be graded. I finished reading those this last weekend. The teacher had included a requirement to also submit a letter to him, reflecting on the process of writing the essays in the project. Most of them were fine–some were very impressive–until I got to this one. Like I said, I’ve never seen anything like this. 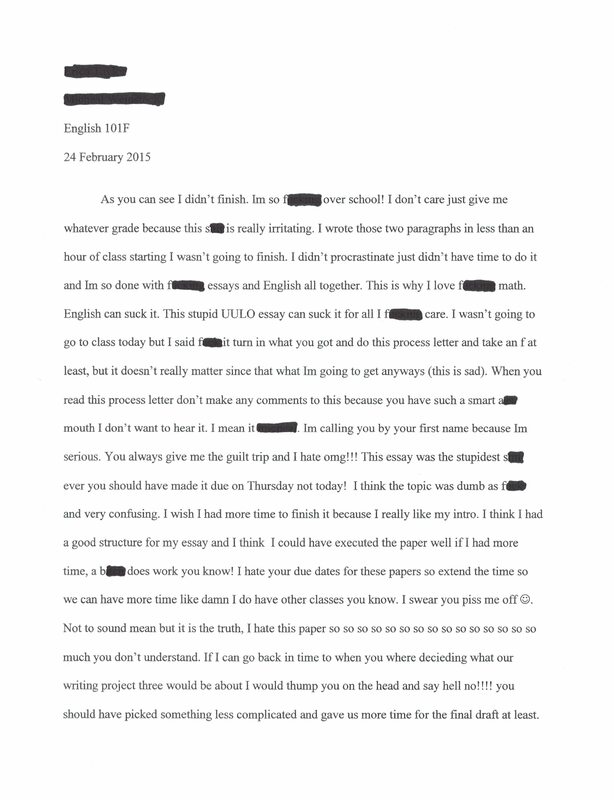 I’ve blacked out the names of the teacher and student, as well as the ten worst expletives. The young woman who wrote this–in her second semester of college!–wasn’t in class today, and frankly I hope she doesn’t come back, because I have no idea how to handle this. You’ll either find this very funny, or a scary illustration of what college in America has become. Maybe both. Wow, it’s actually funny and sad, for different reasons of course. At least she likes math. My personal belief is that we have suckered millions of folks to go to college who don’t belong there. This is Exhibit A. Sign that student up for drama class!